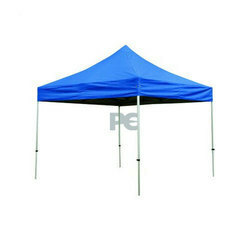 Leading Manufacturer of gazebo tent from New Delhi. The tent will be made up of Imported UV protected waterproof Oxford / PVC coated Tetrone in any desired colour of your choice. The tent will consist of 4 top cones & 4 top facias. The tent will be put over a white powder coated Steel frame, made in sections for easy packing & carrying. The height of the tent can be adjusted as per your requirement in any 1 of 3 available options. The top 4 cones & top facias will have screen printing done as per your design ( no visuals / images ).